If you’ve ever traveled throughout the south and made your way into a small town, you probably came across a mom and pop restaurant at some point. Whether specialized or a simple country buffet, these restaurants are the epitome of southern cooking. 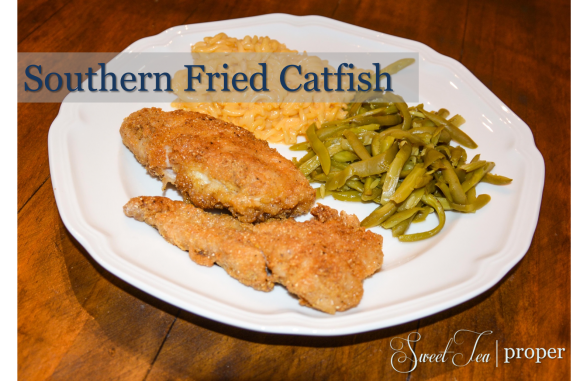 One item that you can find on almost any menu is southern fried catfish. Now I happen to know quite a bit about fried catfish because I worked as a server at a catfish house throughout high school and most of college. Let me tell you, southerners take their catfish seriously. First off, when living on the gulf coast, customers would constantly ask if the fish was local. Then, they would want to know if the catfish was wild or farm raised. Finally, they would want to know what kind of oil the fish was fried in. The last question had more to do with allergies than taste, but some people do have a taste preference. As a sixteen year old, I found these questions annoying. Can’t you just order two catfish filets fried with a side of turnip greens, cheese grits, coleslaw, and be on your way? Now as an adult, I can appreciate or at least understand why people are so curious about where their food comes from. We had the best coleslaw by the way. One of these days I will try to replicate it for y’all. I would watch the cook every morning trying to figure out what the secret was as she made up huge batches for the day. The secret was probably the older woman who whipped it up. After 10+ years, she had it down to a science. Southern fried catfish is not as complex so we will tackle it first. 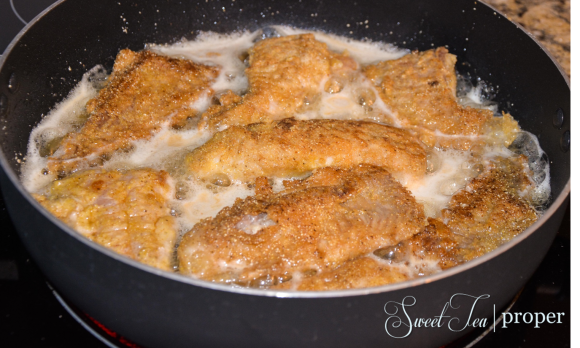 There are three main ways to prepare fried catfish. You can fry it whole (bones, tail, and all), filet it, or in nugget form. My favorite is catfish nuggets because I like my catfish to be extra crispy. If I order it from a restaurant, I have to tell them extra extra crispy or they won’t get it right. Even though nuggets are my favorite, this style is traditionally reserved for the kids so today we are going to make traditional Southern Fried Catfish filets. The catfish in this recipe is pan-fried. However, if you have a deep fryer you can still follow along. You will just be able to cut the cooking time since there will be no need to flip the catfish over. Lay the catfish filets on a paper towel. Pat dry both sides of the filets with a paper towel. Sprinkle a pinch of salt and pepper on both sides of the filets. Line up three shallow dishes. Pour 1/2 cup of flour in the first dish. In the second dish, whisk eggs and vegetable oil. *STP Tip: If you like your food with a little heat, you can add a teaspoon of hot sauce to the egg wash to give the catfish filets additional flavor. Too much heat for some of the people being served? That’s ok. Hold the hot sauce new and make it available to splash on later. For the third bowl, combine the rest of the flour, corn meal, salt, pepper, and paprika. In a deep pan, add half an inch of vegetable oil. On stove top, heat pan over medium-high heat. Take each catfish filet and toss it in the flour, then egg wash, and finally the corn meal mixture. Once the oil begins popping, add the fish to the fryer. Cook the fish for approximately eight minutes, flipping periodically. The filets are ready when the fish flakes throughout. 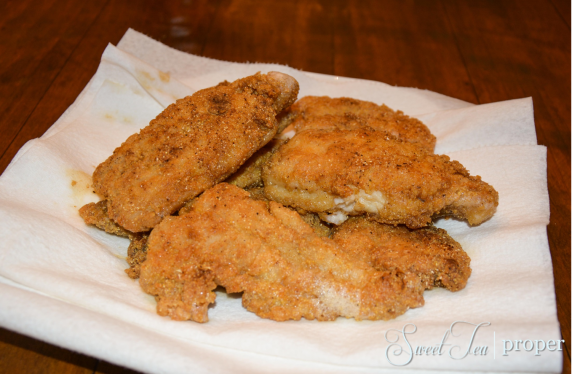 *STP Tip: For extra crispy catfish filets, cook for ten to twelve minutes. Look at all that grease! Frying is not my favorite way to cook. It’s messy and stinks up your kitchen, but if done right, boy is it good! Once the fish is ready you will want to have several layers of napkins on a plate to soak up the remaining grease. I think the cooks at the catfish house would be proud!